Powder coating things around your home can give them new life not only visually but in terms of durability as well. 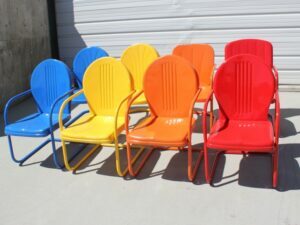 You can re-purpose old items that you have lying around the house, or restore antiques that you find at a yard sale with powder coating. There are thousands of different color combinations to choose from, so it is easy to find something that will match your style. Every job we do is a custom job, so your project will as unique and creative as you are. Powder coating is incredibly durable. It helps prevent damage from UV light, extreme weather conditions, rust, scratches, etc. Powder coating is also very resistant to chipping, fading, and everyday wear and tear. Imagine you found the perfect metal lawn furniture at a yard sale, but unfortunately, it’s painted an ugly lime green, and it doesn’t match the rest of your landscaping. Chances are, you can powder coat that whatever color you would like to fit the rest of your yard. This is true for many things. Powder coating is one of the best ways to customize your life. What Can I Powder Coat? As you can see from our lists above, there are tons of different ways that you can incorporate powder coating into your home, in order to take advantage of the weather resistance and vibrant look that it provides. If you’d like to read more about the benefits that powder coating brings to each of these things, check out our list of growing resources, below! If you have any questions about whether or not we can powder coat a certain object, or would like to know if powder coating is indeed your best option, then don’t hesitate to give our experienced team a call, today! We can help consumers make educated decisions on whether or not it is worth it for them to take advantage of powder coating.